The parlor palm has long been used as an indoor plant in the United States. This attractive little plant was first discovered in Central America and brought back to the United States, where it immediately became a popular indoor palm. It gained a near-instant following for a few good reasons. It's adapted to relatively low light, can handle lower temperatures, and grows in attractive clumps with light-textured foliage cloaking thin trunks. These factors make the parlor palm one of the most popular indoor palms grown in most temperate countries. It is possible to sometimes find single specimens, but most often they are grown in small clumps, so they resemble palm-like shrubs in attractive pots. The fronds are popular in flower arrangements, Palm Sunday decorations, and wreaths and can survive for up to 40 days after being cut from the plant. 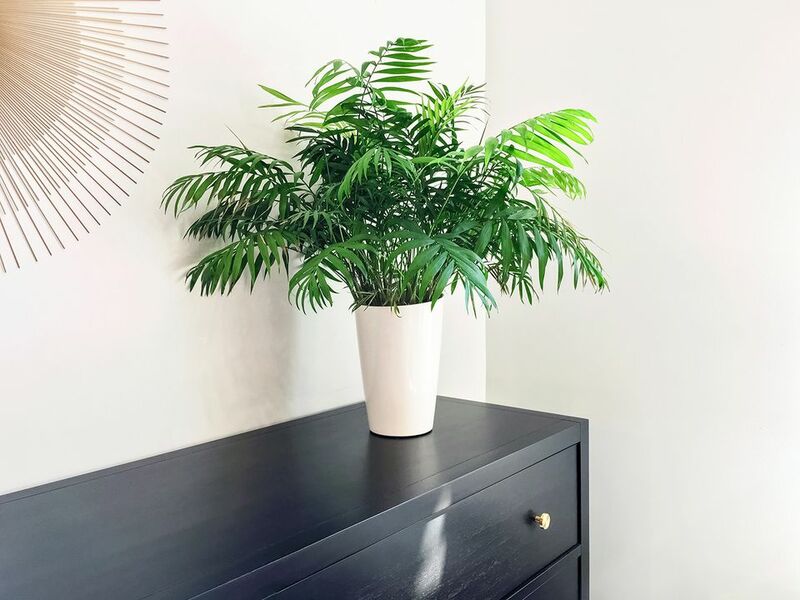 The parlor palm plant is non-toxic for animals and humans. Among all the palm trees, parlor palms are a great place to start for the beginner. They do especially well in 3-gallon pots (about 10 inches) in a northern exposure or foyer, where they show off their fine textured leaves. Because they are tolerant of lower light conditions and sensitive to too much water, they are prime candidates to be "loved to death," either through overwatering or by getting too much direct sunlight. Resist the temptation. Parlor palms are vulnerable to pests including aphids, mealy bugs, scale, and whitefly. If possible, identify the infestation as early as possible and treat with the leave toxic option. These are considered low-light palms, but that doesn't mean "no-light" palms. They still prefer bright, filtered sunlight to do their best. They often do well with northern exposure. Indoors, any high-quality potting mix will suffice. Be careful not to let the mixture break down and become a sponge. Outdoors it grows in sand, loam, and clay. It does not tolerate salty soil. Like many palms, parlor palms are sensitive to overwatering and cannot tolerate being waterlogged or sitting in the saturated potting mix. Even moisture is ideal. Err on the side of slightly too dry rather than overwatering. Water when the top 1 inch of the soil feels dry. Yellow fronds will indicate the plant needs more water. The parlor palm prefers room temperatures between 65 and 80 degrees Fahrenheit. It can tolerate a low of 50 degrees Fahrenheit but will die with a frost. Keep it away from cold drafts near windows, vents, and outside doors. It will thrive with average humidity. If your palm begins to develop dry leaf margins or brown tips, it's most likely caused by cold drafts or prolonged dry periods. Try to raise the humidity in these circumstances before overwatering. Feed with a weak liquid fertilizer once or twice during the growing season and not at all during the winter. They are light feeders. Parlor palms have weak root systems and grow relatively slowly, meaning that repotting should only be done with care. In general, the plants stay a manageable size, so you shouldn't have to repot more than every other year. If your potting media breaks down and becomes mucky or sponge-like, then repot to prevent root rot. These are almost always propagated from seed by professional growers. It may be possible to divide a clump into two smaller clumps successfully, but this is not recommended. The plants aren't clumping by nature but grown in clumps for aesthetic reasons. Otherwise, they cannot be propagated by stem cutting or leaf cutting. In general, it's best for most home growers to buy a new plant rather than attempt propagation. The main parlor palm is the C. elegans, which is native to Mexico and Central America. This type is sometimes used in dish gardens. The related bamboo palm, C. erumpens, comes from slightly further south and is a bit larger, with more fan-like leaves. A few other varieties are sometimes seen in the trade, including the newer C. hooperiana, which resembles a kentia palm.